Are ancient mtDNA sequences from Syria of Indian origin? The authors sequenced the HVS-I (and nothing else!) of the mtDNA of four individuals from Tell Ashara and Tell Ashaik sites of ancient Terqa and Kar-Assurnasirpal (Syria, Euphrates river). And then they proceded to establish a bit unlikely comparisons with East and South Asian M sublineages, of which only one is present today in the region. The first two are attributed to M9, the third one to M61 (a quite rare haplogroup) and the last one to M4b (the only one to be found in West Asia nowadays, specifically in Arabia Peninsula). 223 describes R, hence counting from the CRS, it should mean L(xR). 311 describes L3, hence counting from the CRS it should mean L(xL3). So all four should be L(xR) and MK13G117 looks like L(xL3). Exceptions for 311 (consistent with the sequence above): L3b1a3, M4’65’67, M10, M29’Q, M31a1, M56, M57 and M74. However M9 does not make it because to begin with it needs a transition at the 362 site. The authors got carried away by their own pre-conceptions and the marker 234, shared by three of the four sequences. However, while that marker is found in M9a, it also needs the 362 marker, which they both lack. So they are not M9 but something else. More plausible candidates could be, at least for TQ28F112, M30d/e or M49. As for the rest, there are no modern sequences, at least via PhyloTree (but neither within the study’s own comparisons), that are good correlates. All we can say with certainty is that they are L3(xR), except in the case of MK13G117, which can only be described as L(xR). Maybe if they had tried sequencing the coding region, as in my understanding, they MUST (destroying or damaging valuable ancient bones to do this mediocre research is not anymore justified, if it ever was), they would have got useful and informative results. Now we just have again another frustrating set of nearly useless HVS-I sequences, which can only be ambiguous in the vast majority of cases. Ah, by the way, there’s no obvious correlation between these Metal Ages’ sites and ancient Sumerians, of course. Even if the lineages are South Asian by origin or affinity, which is possible but by no means demonstrated, they would at most suggest a relation between the Mid-Upper Euphrates and that area. The region was under intermittent Sumerian, Amorite, Babylonian, Kassite and Assyrian control but mostly is a distinct country within the greater Mesopotamian area. Notice that previous research (ref.) in the same area but from the Neolithic (PPNB) period has found (also HVS-I) large amounts of mtDNA K, some H and also some L3(xR). [Note: edited because some ethnographic assumptions I made initially seem to be quite wrong]. Only one is needed, and the 12,000 years-old village Hasakyef fulfills nine of the ten possible reasons to be declared World Heritage Site by UNESCO. Yet the Turkish colonial authorities are not interested in seeing this village recognized in any way and therefore the site remains mostly forgotten. Ankara wants to build there one of the most important reservoirs of the Turkish state and another interested party is the Austrian company VA TECH, subsidiary of the German multinational Siemens AG, which would get the bulk of the construction deal. It is not just a problem of resettlement, of opposition by the locals, who actually don’t even feel represented by the Turkish state at all (they are all Kurds and feel oppressed in a colonial way in fact), it is not just a problem of water robbery to other states like Iraq, it is a problem of a major heritage site of Humankind, dating to the Neolithic (Kurdistan was probably the major boiling cauldron of innovation in the early Neolithic, even more important than the Levant surely) and transiting through all ages until present day, being destroyed by the imposition of a colonial government and the lack of interest of the World. While the dam has been planned for decades, this time it seems very serious. Conservation laws have been sidelined and 3000 people are already working in the preliminary part of this destructive work. Yan Klimentidis mentions today that, according to a new paper (Cerqueira 2012, pay per view) as much as 64% of skin pigmentation can be predicted from genes (many of them), reaching to as much as 94% with freckles. The rate of success is much lower however for hair and eye color (44% and 36% respectively). Are Ethiopians genetically adapted to high altitudes? I’m generally skeptic of claims of genetic adaption to high altitudes when it does not seem to have ever been demonstrated that this adaption is genetic and not just mere biological flexibility caused by living in the area since childhood. In any case, L. Scheinfeldt 2012 (open access) claims that some candidate genes have been identified for the Amhara. Taurine cattle could descend from as few as 80 female founders ··> R. Bollognino 2012 (ppv). Honey and human evolution: surely you never thought about it before, right? Nutritional anthropologist A. Crittenden thinks that honey may have been more important than meat, based on Hadza practices, which include symbiosis (cooperation) with a bird ··> The Rebel Yell. Did prehistoric climate change affect human evolution the same as other animals? That is what J.R. Stewart and C.B. Stringer argue in a paper (ppv) ··> Science Daily. Speculating about Still Bay culture (South Africa) and climate change ··> article by archaeologist J. Tolleson at Nature. First evidence of hunting in Ohio c. 13,500 years ago ··> Cleveland Museum of Natural History. Universal rock art script? David Sánchez mentions again[es] (I commented in 2010 too) the unusual hypothesisi of G. von Petzinger on the possibility that some sort of universal script used by hunter-gatherers around the world, as the markings on the walls appear to be roughly the same everywhere. I am rather skeptic though but curious anyhow. Among the links provided some are in English: video, The Guardian, New Scientist, UVic Space and Cambridge University. 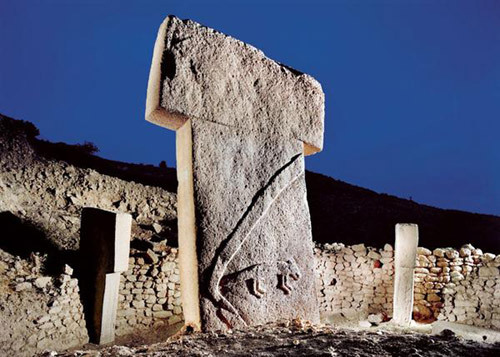 Göbekli Tepe attracted worshipers from 500 kilometers around: from Cappadocia and the border of Armenia ··> Live Science. Some Neolithic settlers may have arrived to Iberia from North Africa (specifically Oran area) ··> Archaeology News Network. Chalcolithic settlement found in Galicia, between Carballo and Berdoias, not far from the mamoa (dolmen) of O Valouco, as a highway was being built ··> La Voz de Galicia[es]. 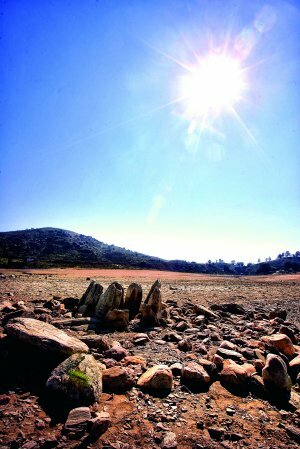 Two dolmens found in Alcónetar (Extremadura, Spain) as the water of the reservoir of Alcántara, one of the largest in Europe, recede because of unprecedented drought ··> Hoy[es]. The oldest toy car (right) is as old as 5500 BCE and was found near the North Kurdish town of Qoser (Kızıltepe). The car is worked on stone, has axles of different length and pre-dates Indoeuropeans by a lot. Previously the oldest known toy cars were from Turkmenistan (Altyndepe) or Mesopotamia, being dated to the fourth millennium BCE. 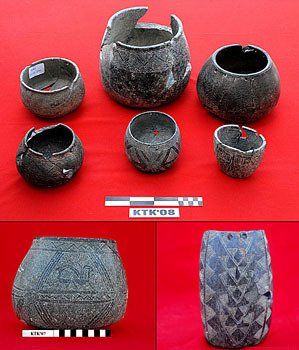 Other findings in the same site (also worked on stone) are dolls and whistles, the latter still able to produce sounds. These however could be more recent, from the fourth millennium. Sources: Sunday’s Zaman[en], Pasado y Futuro[es], Pileta de Prehistoria[en]. Ehud Weiss and Daniel Zohary, The Neolithic Southwest Asian Founder Crops,Their Biology and Archaeobotany. JSTOR, 2011. Open Access. Einkorn wheat (Triticum monococcum) is native as wild from Anatolia or the Zagros area, most probably it was domesticated in modern Kurdistan (aka SE Turkey), in Çayönü or Cafer Höyük. Frome there it spread, along with PPNB to Syria and Palestine. Emmer and Durum wheat (Triticum turgidum) is native from the Levant and the Zagros but not Anatolia peninsula. It was also domesticated (most probably) in the early PPNB of Kurdistan (Çayönü), spreading soon after the Damascus basin of Syria, where the Emmer variant may have been selected for (Tell Aswad). Cypriot evidence is declared unconvincing by the authors but not totally rejected. Barley (Hordeum vulgare) is a sturdier cereal even if also less valued than wheat. In its wild form it has a similar principal distribution as T. turgidum (Levant and Zagros but not Anatolia), although it also scatters through the Iranian plateau. The earliest clear domesticated variants are from Syria (Tell Aswad) and Cyprus, but soon also expanded to Southern Kurdistan (Jarmo), Iraq (Ali Kosh) and Palestine (Jericho). Bitter vecht (Vicia ervilia): it is not really studied in this paper. It has an ample wild origin area and was maybe domesticated in Anatolia or Levant. Lentil (Lens culinaris): the wild variant is scattered through much of West Asia but it is relatively rare with preference for stony and disturbed soils. It appears along with early cereals in wild form but the first clearly domesticated case is from Yiftah’el, North Palestine (aka Israel), within a middle PPNB context. Pea (Pisum sativum): there are two wild forms, one scattered through the Mediterranean and the other more specific of West Asia. This one (P. humile) is the one proposed here to be the main ancestor of cultivated peas (but with weak support). The earliest finds are from Syria, Kurdistan and Palestine but the first large amounts are from Southern Anatolia: Çatalhöyük and Erbaba. The discerning of wild and domesticated type is no easy in this case but the available evidence seems to support Çatalhöyük or nearby areas for the domestication of this pulse in the middle or late PPNB. Chickpea (Cicer arietinum): ever wanted to know what Cicero means? It mens chickpea indeed. Anecdotes apart, the wild chickpea is almost exclusive of the Northern Kurdistan (SE Turkey). Naturally the first consumption findings are also from that area (Çayönü, Tell Abu Hureyra, Aşıklı Höyük – all from early PPNB). It is however impossible to tell from sure if theyw were already domesticated of wild. Contemporary remains from Jerciho however must be domesticated (as the wild form is not found in the region). 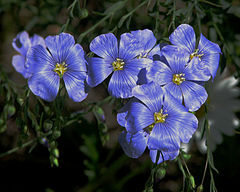 Flax (Linum usitatissimum): flax can be used for fibers (surely at the origin of textile crafts) and for oil. Wild flax is widespread across the Mediterranean basin and even as far North as South England or Crimea. Genetic data indicates that the first agricultural use of flax was not fiber but oil, even if flax fibers were already used before Neolithic (30 Ka. ago in Georgia). The earliest finds come from Çanönü and Tell Aswad. However the earliest reasonably safe case of a domesticated variant is from Jericho, just a few centuries later. Some time later (9th millennium BP) the first known fiber clothes are known (Nahal Hemar cave, Palestine), however this kind of evidence is highly subject to climatic conditions (extreme dryness here). It is interesting that no evidence of early domestication is found for PPNA. Does this suggest that this culture of Palestine and Syria was maybe not Neolithic after all? The main attribute of this culture of the Levant is their granaries but what did they store in them if all the crops were domesticated further North or in a later date? Only barley and maybe peas are from the Levant first according to this paper but from PPNB dates anyhow. So, are we missing something or were PPNA “farmers” actually mere large-scale semisedentary gatherers, i.e. 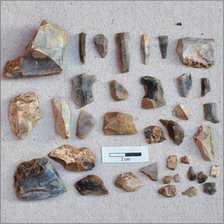 Mesolithic instead of truly Neolithic? Your call. On the other hand it is also interesting that nearly all early domesticates seem to be from the area of Kurdistan, which in my understanding, illuminates the mystery of Göbekli Tepe, which looks like the spiritual center of early Neolithic or at least the consolidated Neolithic of PPNB (notice that while the early village is from PPNA, the enclosure is from PPNB dates). They show that the river Wye, at the Welsh-English border, was used for food and transport by Epipaleolithic Britons, some 6500 to 7500 years ago. Dated to c. 10,000 years ago, they include some nice artwork on chloritis, a greenish semiprecious stone. The artwork includes several panels on this material and some smaller objects.